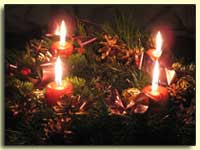 I think our family will read this Henri Nouwen poem around our own Advent wreath this Sunday. It is perfect for that moment. I am glad that these poems found you, and through you, their way to us! A. Thank you for the moment of quiet in the middle of this day and this season, and at the end of this crazy week. Whose brilliant idea was it for us to come back and "teach" for THREE MORE DAYS next week?!?! Carol...I check your blog every day! I love the poems you've chosen for right now. I spent lots of years on the basketball bleachers too. Enjoy every little thing about this Christmas with your boys... celebrating the birth of Christ and your wonderful family! I love that last one. What a peaceful, hopeful prayer. I think I'll read the first poem to my students next week. The second one is really beautiful and peaceful. Thank you for sharing that!